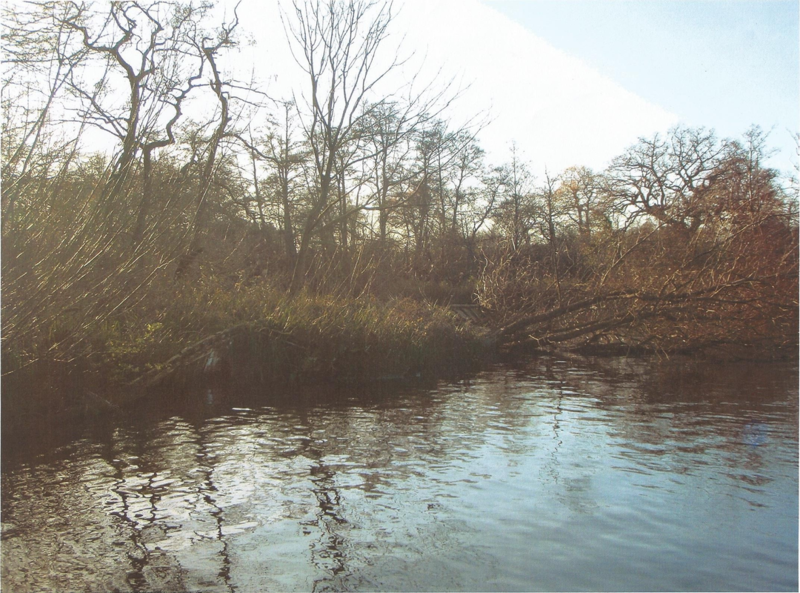 We are constantly learning more and more about Salhouse Broad, gaining new photos brought in by locals and visitors alike. I am fascinated by the history of my work place, so strive to piece this puzzle together. If you have any old photos or memories that you would like to share, please get in touch. 8000BC- The Broads are based on alluvial deposits of peat and silt laid down around 10,000 years ago. 900s - The site was dug by hand for sand and gravel. Today, we can see the sandy beach is a result of this extraction. 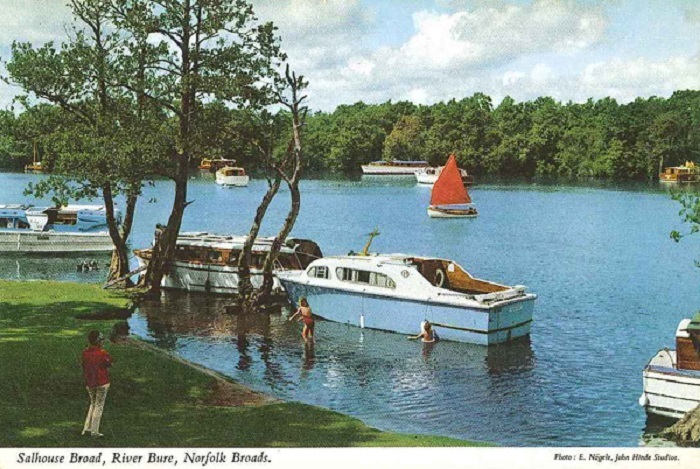 Joyce Lambert, a young botanist in the 1950's, deduced that the Norfolk Broads were not created naturally, but instead were man made. This finding transformed our understanding of the Broads today and our knowledge of the economy of the area in the middle ages. 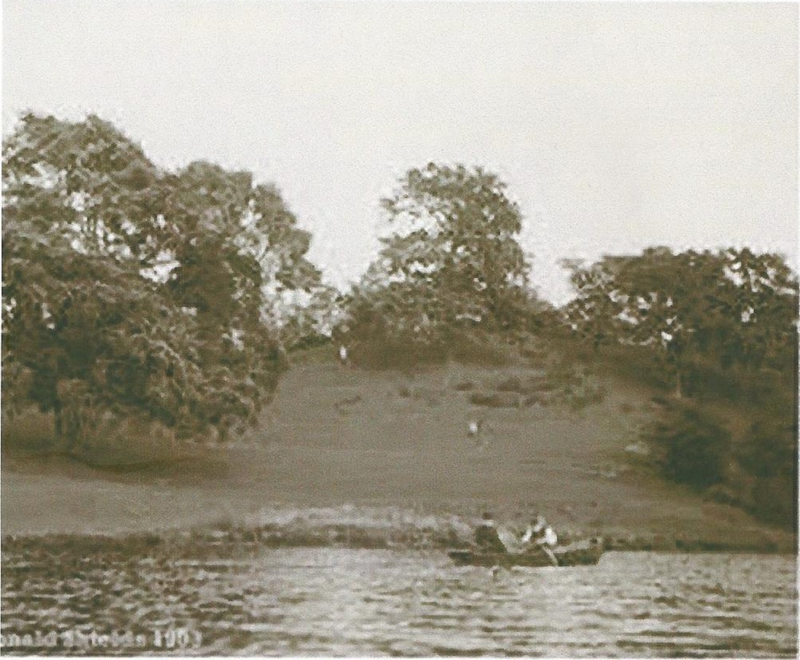 Joyce conducted her own research, whereby she made a selection of close space borings through the silt to the underlying peat in a variety of locations within the Broads, upon which she realised that the watercourses were mostly basin- shaped with vertical, rather than sloping slides, highlighting they were dug out by man. 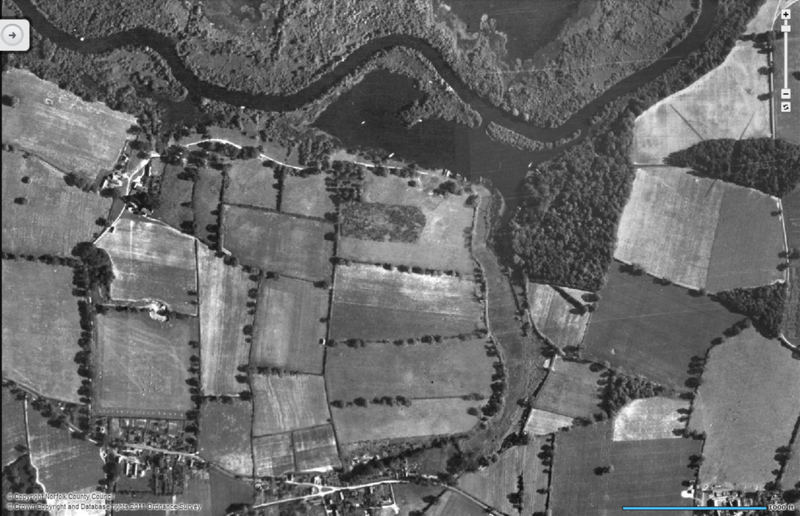 This realisation was initially received skeptically at Joyce's presentation to the Norfolk and Norwich Naturalists Society in 1952, as it was understandably puzzling as to how such extensive excavations could have been dug by hand within areas of the floodplain, that are now subject to regular inundation. 14th Century (Middle ages) - The pits gradually flooded with water from a local river, which made it increasingly hard to dig for resources on the site. The flooding formed the unique network that is now the Broads. Joyce and her colleagues attributed the flooding partly to a deterioration in the climate of East Anglia, and partly to sea level rises. 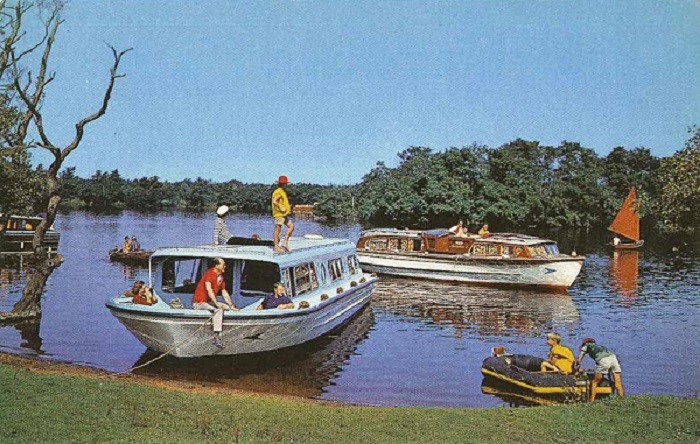 At this time, the Broads were used for commercial transport, with wherries carrying cargo of farm produce, coal, beer, bricks, timber and even ice. 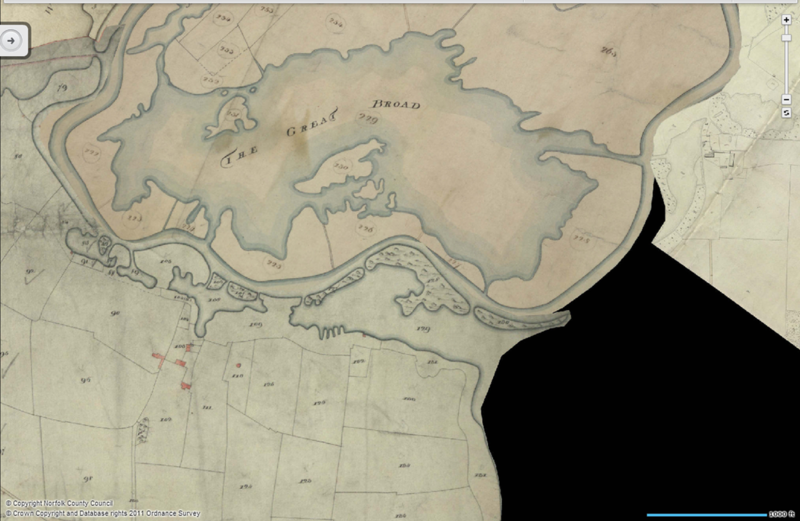 River trade- bringing in raw materials and exporting finished goods, helped to make Norwich England's second city. 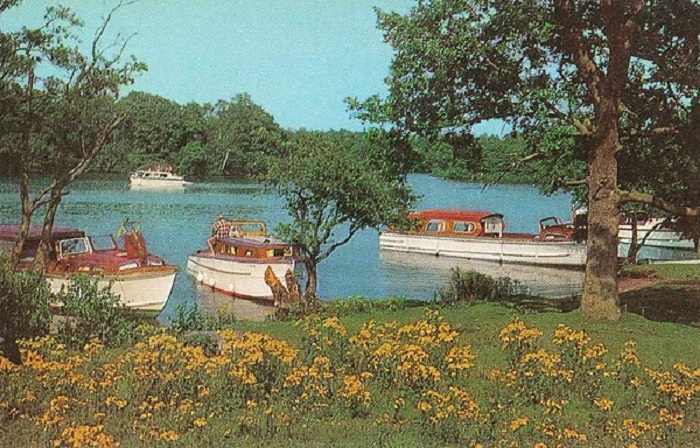 It wasn't until the road network became dominant that the Broads siezed to act be used for commercial transportation. Interesting fact: Wherry men were not adverse to a little smuggling. In one famous case, a wherry man was sentenced to four years hard labour and the confiscation of his craft due to smuggling. However, his friends were quicker than the law and took the wherry and sunk it in a broad. When the owner came out of prison, they raised it to find the cargo still intact! Mid 17th Century- The big Oak tree , which sits in prime place on the Hill overlooking the Broad, began its life. 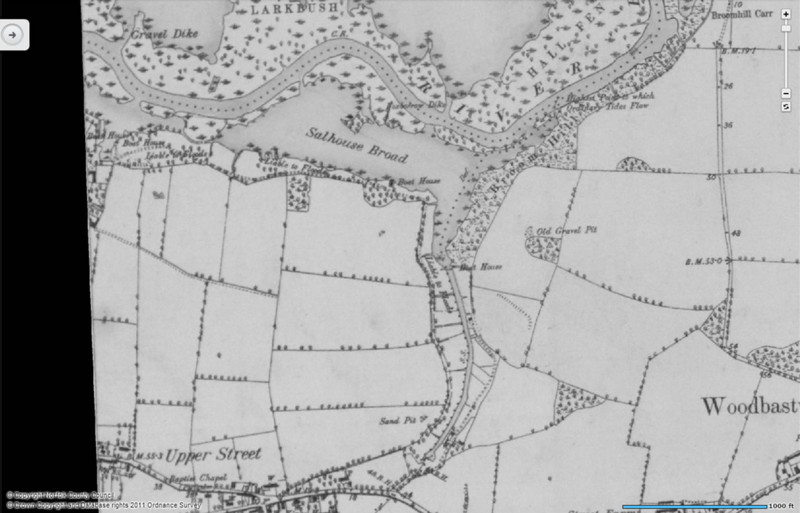 Farmer owned Salhouse Broad & Broad Farm - Reggie Youngs? View in 1902. 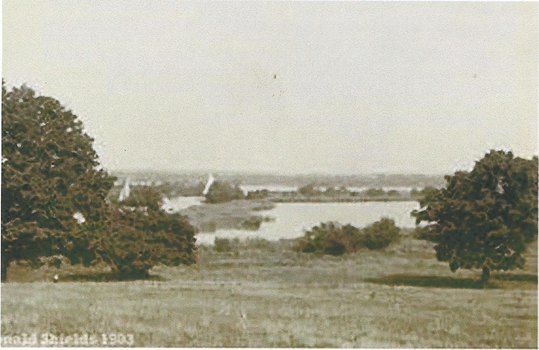 Note how far you can see- there were far less trees in 1902 than there are now. Early 1900s - first part of the Broad bought (as far as one could walk into the Broad, up to the knee) by the Cator family. 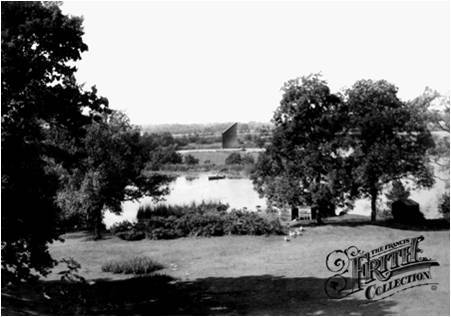 At this point, the waters of the Broad would have been much cleaner than today, with many more waterlillies, reeds and other large water plants along the banks. Since then, with more people living around the area and using the Broad, and more intensive farming practices occurring in close proximity to the Broad, the waters have become more nutrient rich, in particular with phosphates and nitrates. 1926 - the rest of the Broad is conveyed to John Cator. 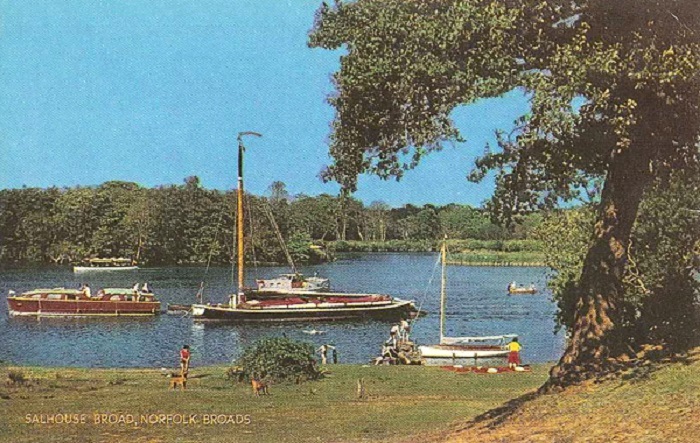 Second World War- Salhouse Broad was a popular destination during the second world war. As the beaches along the coast were closed and protected against invasion, people had to look for alternative places to relax during the Summer months. At this time, the sandy beach ran the whole length of the left hand bank (before being replaced by quay heading to allow more boats to moor up). 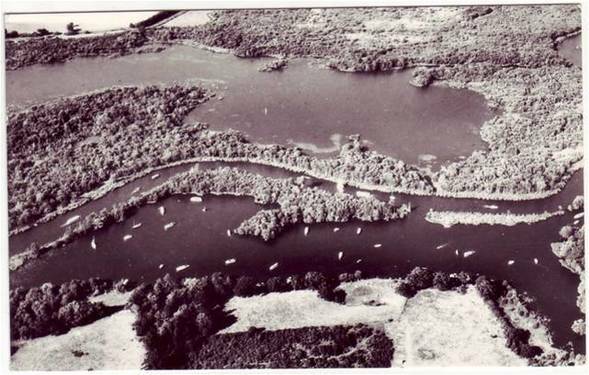 An aerial view of Salhouse Broad and Hoveton Great Broad in the 1960's. An ML350 in Newlyn Harbour in Wales. 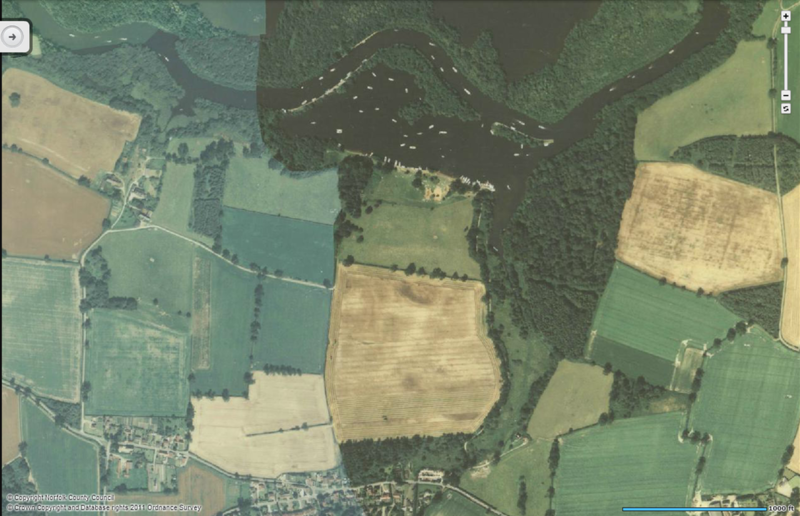 We think this is of the same design as the wreck in Salhouse Broad, although a little more intact. The shape of the bow and the apurtures are very much like the wreck. The old wreck which lies at the mouth to the Old Wherry Cut, and is gradually dying away, is thought to have been a Submarine Chaser, or Gun Boat in World War One. It is likely that is was a Motor Launch order from the USA and built by the Canadians, delivered between 1915-1916 in the batch ML1-550. In all there were 580 motor launches (ML), also known as Mosquitoes. After World War One, the ML was bought privately by a local character known as 'The Major', and used as a pleasure craft. For many years she was enjoyed by her owner on these waterways. From the video we can see that in 1953 that it still had the name Water Witch written on the bow. 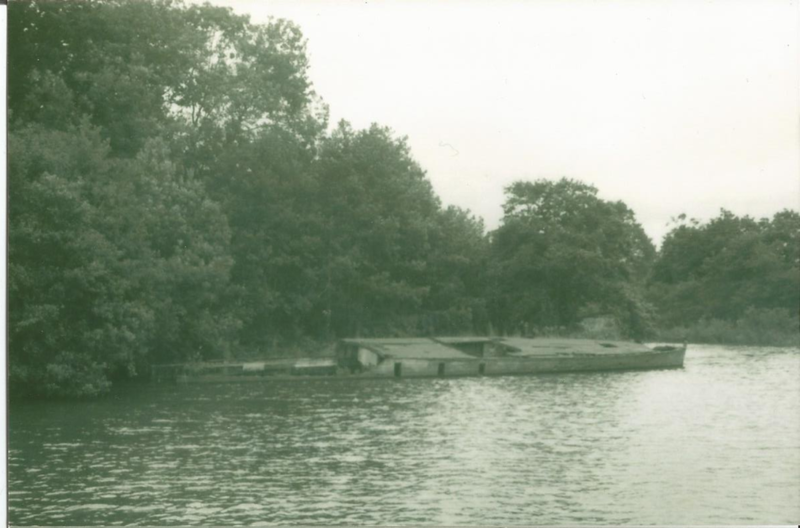 At the start of World War Two the boat, along with others, was requisitioned by the Ministery of Defence and moored on Salhouse Broad with arrangements of posts and wires to deter German seaplanes and spies from landing. 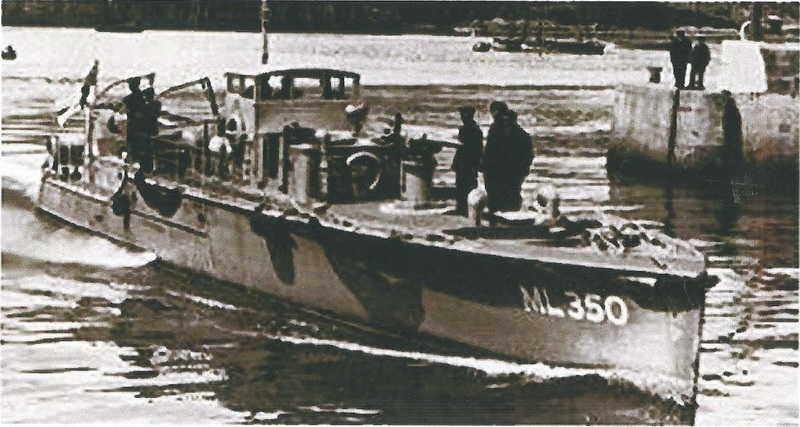 Following the Second World War, any similar boats that were in good enough condition, were taken to boat yards for repairs. Water Witch was not so lucky and remains on Salhouse Broad today. The wreck is now overgrown with reed and saplings. Work is being planned to cut back the foliage to allow us to see the beautiful gun boat once more.